Lush Ceridwen's Caldron is a relaxing bath melt for softer skin. It contains cocoa butter, whole oats, walnut oil, tangerine oil and lavender oil. Vegan. I used the bath melt recently and loved it. I’m a regular user of lush bath bombs, however this was my first time using a bath melt. The smell was quite gentle and non offensive. It dissolved slowly in the bath and left the water beautiful and milky. My skin was lovely and moisturised afterward, however I did follow with a moisturiser (as I usually do). Leave it in the cloth and you can rub the cloth over you for a gentle exfoliation. This is a lovely bath melt. Is probably one of the more subtle Lush products. There is a little scent but it is not overpowering or overly sweet like some of the other Lush products can be. It also does not contain glitter. Just drop the whole bag in your bath and the milky goodness starts to ooze out. 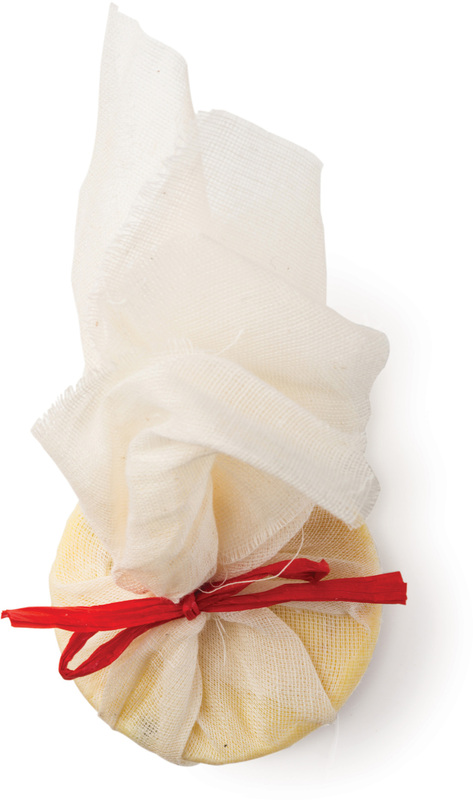 This bath melt contains oats which are known to be soothing to irritated skin. It is moisturizing and great for sensitive skin. Smells wonderful and leaves the skin moisturised. I love having baths as it helps to relax me. I have never tried Lush products before and this was my first purchase. I used the whole bath bomb in one use and I wasn't aware that I can reuse it. It is packed in a cloth compared to Lush other bath bombs. It comes in the size of roughly 6-7cm diameter or small baby fist. It is not highly pigmented like some other Lush bath bombs. It has a strong vanilla sweet smell which I did not like. It melts well under water and distributes evenly. After melting in water the scent is actually much better. It certainly contains plenty of natural oils and moisturised the skin beautifully. One thing that I dislike about this is the oats. Although on paper reading the ingredients oats sounds great, but it leaves so much residue in the bath after draining. The last thing I want to do after a beautiful relaxing bath is to scrub my bath tub clean. Overall it is a very pleasant experience using this bath bomb. I am certainly going to try other Lush products. Need to clean away the oats residue after use. A soothing bath melt that leaves your skin soft and smooth, your senses revitalised and your body relaxed. The oats turn the bath a milky white and the various oils scent your skin; you can use the bag as a wash cloth to wash your skin, gently exfoliating it at the same time. I re-used this bath melt, getting a total of 3 uses out of it after taking the Lush sales assistant's advice. Great value, would definitely re-purchase this. Can be re-used a couple of times. I love lots about this! Firstly, it doesn't dry my skin but leaves my whole body feeling fully cleansed, fresh and my skin soft and moisturised. It's actually soothing to use on my itchy skin on my shoulders and upper arms. It leaves my skin feeling really comfortable. Secondly, it smells great: a bit woody with a tiny touch of floral but I would call this more a woody scent than anything and I think that guys could also easily like this scent. It does melt fast and I thought I'd get it to last longer than what it has but so be it! When it's this effective, this luxuriosly natural and this perfectly scented (I love woody scents!) then that's okay with me! Just two showers worth is all it lasted for me. I love the exfoliating exterior muslin cloth with it's slighly scratchy feel. I don't unwrap it - I just rub it all over my body, leaving the soapy thing inside all wrapped in it's cloth the whole time. This is so soothing, exfoliating and also cleansing that I would buy it again even though it gets pretty pricey for just two goes a shot! Maybe if I broke it in half next time and stretched it's use out a bit longer that way it would be a bit better value for $?! Vegans!! Male, female, luxury showers/baths where you want to feel nice and clean but also moisturised and have your skin left comfy. I purchased this bath melt after reading it had oatmeal in it. I know how good that is supposed to be for sensitive irritated skin. I first used my bath melt when i had a bad skin reaction (I regularly breakout in unexplained hives) I popped it in my tub and its scent was absolutely gorgeous. It took quite a while to melt all the way so it lasts for a nice long soak. Once the inner ingredients are melted all you are left with is oatmeal that has been infused with softening calming ingredients. I actually used the muslin bag it came in to rub over my skin and I got this gorgeous milky liquid that felt amazing on my skin and the bag doesn't seem to stop producing it either. This melt leaves your water looking like milk. When I hopped out my skin felt calm soothed and incredibly moisturised and soft definitely could skip the moisturiser . The scent it left on my skin was very subtle but kept me feeling relaxed and soothed for the rest of the day.